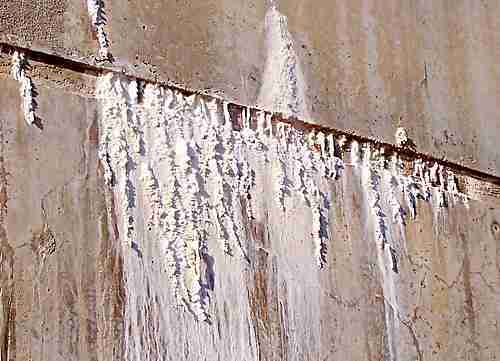 What is efflorescence? It is a build up of mineral salts that form in a similar way to stalactites in a limestone cave. A reinforced concrete blockwork wall, 200 thick. Where I live we don't see a lot of this build up of mineral salts that leaches out of untreated cement or concrete surfaces. For the most part the problems usually occur and are more obvious and worry some in face brickwork or blockwork. Most of the masonry houses where I live are now built with concrete blockwork walls are the are finished in the following ways. Painted. The paint protects the blockwork, it seals it from water penetration and changes the colour. Plastered, with additives in the plaster to waterproof it. Sometimes colour is added also. Plastered and then painted, this is by far the most common method in my neck of the woods. Clear finished with a clear sealer to waterproof the walls. The clear finish is normally only used when coloured blocks are used to preserve the look of the blocks. Any cement or concrete based product can be prone to efflorescence, but it shows up mostly on the clear finished or unfinished cement bricks or blocks. Painting and plastering should be done early, before the onset of efflorescence. This just about always stops it's appearance. Build up around the construction joints of a concrete water tank. Here you can see quite plainly, small stalactites forming on the outside of a concrete water tank. In the case above, water is slowly leaching through the construction joints in the concrete wall. When the water evaporates out a white powdery build up is left behind. The water itself (from whatever source) may contain the mineral salts that cause the problem. The water could be dragging the salts out of the actual concrete, brick or block material. Quite often it is the mortar in brickwork or blockwork that is causing the efflorescence. It is common to see it following and leaching downwards from the mortar joints. Clay bricks seldom give off efflorescence, but of course they have to be laid in mortar. When concrete products are manufactured they can and do show signs of the big "E", but these are very few as the manufacturers take steps to minimise it. How to if not stop efflorescence, at least minimise it. This action of depositing mineral salts is directly related to moisture, so reduce or stop the source of water. If I was building a blockwork house, I would try my hardest to convince the owner that clear finish blockwork is not a good idea. If I had to do it, I would keep the blocks themselves dry before laying them. This keeps the block layers happy also, they don't want wet blocks. In the wet season I have been known to cover the tops of the walls every night and sometimes when we were were quick enough before the rain hit. I can't say if it did any good really, but you must try. When we corefill reinforced blockwork we use a runny concrete mix, and it is also common to hose down the insides of the cores as much as possible just before the pour, to stop the dry blocks from sucking out the moisture in the corefill before it gets everywhere it has to get. So we have a catch 22, water down the blocks and get efflorescence, or don't water the blocks and the cores may not fill completely. No question, the strength and integrity of the wall has got to come first. Ongoing efflorescence could be a sign that water is getting into the walls, through flashings, or a breakdown in the clear sealer or a failure in a damp proof system allows ground water to rise up the wall. How to remove the big "E"
If you have it bad, don't expect to get it all off. Get the wall bone dry an then try to remove the dry powder with a stiff brush. Then lift off what you can with a damp sponge. Water blasting or hosing down might initially look good, but you just put some of the stuff back into the wall, and you have soaked the wall so that the drying process will bring it and more out again. Don't use phosphoric acid. It is often stated that it will clean off efflorescence. It will, but you have to use it very diluted, and then you have to wash the whole wall down after to shift all the acid residue, so you may start the same cycle. It works but not good enough to compensate for the inconvenience and danger to the user. Same thing with strong alkaline cleaners, they work but are not really worth it. In a worst case you could be putting more salts into the wall.